I love eating soups especially now that we get a new batch of snow almost everyday. I don't like babysitting my food over the stove so I tend to use my slow cooker and pressure cooker a lot. I came across a slow cooker chicken noodle soup on Pinterest. I made it and it tasted delicious. Replace the egg noodles with 2 cups of cooked brown rice. I made the soup exactly like that for my husband. For myself I picked out the carrots since they are not listed in the vegetables you can eat. Now you have yummy comforting soup you can eat while on the plan. Since it made so much my husband and I had enough for lunch the next day! This is like our local rice soup -Lugaw and Goto . I love soups and this will be a good recipe to try. Looking to go back to my back to basics for wls and this recipe might be good to try! YUm! A nice healthy soup for the slow cooker. I pinned this! This soup looks DELISH!!!! I love making soup in the slow cooker. It makes the house smell great all day! I love that you call cooking "babysitting." That's perfect. I, too, despise babysitting food and will cook whatever I can in the slow cooker! I find that interesting that carrots are not listed in the vegetables you can eat. The soup looks really good and I prefer slow cooker recipes. Wow this soup looks great! I love cooking in my slow cooker it helps to savory the flavors to me. So easy and a great way to use the veggies hanging out in the fridge! I was going to try the Dr. Oz diet, but realized its not healthy to eat that low of calories, so I am just going to eat healthier and try to watch my calorie intake to about 1200-1500 daily. But the soup does sound good on this cold day! I do eat about 1200 calories or more on this diet. Your calories add up when you are drinking a smoothie, eating 5 ounces of protein, a container of yogurt and all the nuts, veggies, beans and hummus you want. The soup looks yummy. I could eat soup everyday. That looks so yummy!! I can't wait to whip up a pot! Ha! I'm watching a taped version of Dr Oz as well speak! I'm always looking for slow cooker recipes! Thanks. 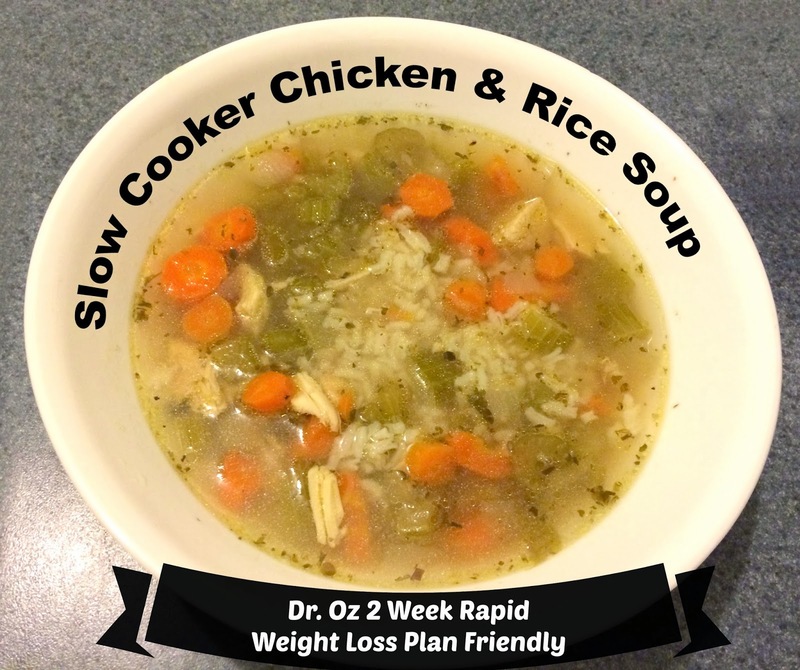 i am not following or looking to follow a diet but I do enjoy chicken and rice soup! I missed dinner tonight - was too busy. And now I really want some of that soup! That soup looks really, really good. And it's good for you! What a treat! See now, I love chicken and rice soup, unfortunately, the children don't seem as fond of it. Such a simple way to make it healthier though. And it looks great! This looks like a really tasty soup! This looks really good. I think that I will try it this week. Thank you for sharing. What a delicious soup! I think I'll just have to try it out :) Thank you for sharing the recipe. Soups are awesome and so filling. My kids don't like soup though so it is hard to prepare a meal. Pinned for later.....looks very easy and YUMMY! I like how chicken is tender when it's been in a slower cooker for some time. Your recipes look delicious. I'm cracking up over the equating cooking a lengthy meal with babysitting. It's exactly how I feel, too! I have a book of gluten free recipes specifically for slow cookers and I really need to use it. Your soup looks really yummy...I prefer rice to noodles in my soup, too. This looks yummy. I'm going to pin this!